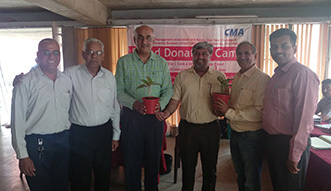 Chandigarh Management Association – with a view to encourage youth to come forward for the noble cause of donating blood to save lives took a step forward. CMA jointly with Rotary Club conducted a blood donation camp at University Business School (UBS), Panjab University, Chandigarh on October 30, 2017. Prof. Deepak Kapur, Chairman of UBS inaugurated the Camp. In addition to students of UBS, student from various departments came forward for this noble cause and donated blood. The students were seen to be full of enthusiasm to donate blood. Some of the first timers shared that they are having the proud feeling after donating blood. The passion was evident from the fact that 55 donors had turned up to the camp. Mr. Deepak Dhingra, Mr. Hitesh Gulati, Mr. Karun Kashmiri were among the firsts to donate blood.